The Peculiar American Struggle Over Health Care Reform, Paul Starr, Yale University Press. It is peculiar, isn’t it? The United States spends a disproportionate amount on health care—about 17.6 percent of GDP versus an average of about nine percent in other economically advanced societies—yet unlike other capitalist democracies, a huge percentage of the U.S. population (50 million people, as of 2010) goes without health insurance. Americans also experience forms of economic insecurity that are virtually unknown in other advanced countries, like “medical bankruptcy,” “medical un-insurability,” and “job lock” (the inability to change jobs or start a business for fear of losing health benefits). 1. High health-care costs equal high health-care incomes, which explains why special interest groups resist policies that reduce spending. 2. Those who are reasonably well-protected want to maintain the status quo. 3. The complexity of the health insurance system makes it difficult for Americans to understand their own interests. 4. Ongoing distrust of politicians and government. In later chapters, the author looks back at the tortured history of national health strategy, which has frequently been characterized by great interest in reform, “but not necessarily a readiness to make sacrifices to reach common ground,” he writes. Starr goes on to analyze the reforms of the Patient Protection and Affordable Care Act, which are ambitious, but comparatively limited when compared to the health-care systems of other democracies. “The law does not substantially alter how medical care is organized,” notes Starr, though this hasn’t prevented Republicans from portraying it as a government takeover of health care. “Most Americans with secure, employment-based insurance will see little difference in their own coverage or health care,” he advises. However, as Starr makes clear, the law does have some important new rules, including those that “prohibit [insurers] from refusing to cover pre-existing conditions or charging according to an individual’s health.” It also bans lifetime and “unreasonable” annual limits on coverage, potentially putting an end to the problems of medical uninsurability and medical bankruptcy. Despite these seemingly quantum leaps forward, the law faces an uncertain future, as Republicans work to obstruct implementation of the Affordable Care Act at both the federal and state level. “A swing in power to the Republicans could bring about a complete turnabout in national health policy. Instead of attempting to control health-care costs, the federal government would wash its hands of the problem,” writes Starr. F This Test—Even More of the Very Best Totally Wrong Test Answers, Richard Benson, Chronicle Books. It's About Nothing—Schott’s Original Miscellany, Ben Schott, Bloomsbury. Any Given Monday—Sports Injuries and How to Prevent Them, for Athletes, Parents, and Coaches, Dr. James R. Andrews with Don Yaeger, Scribner. 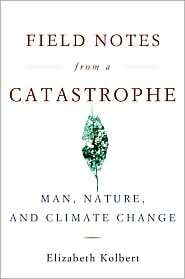 Field Notes From a Catastrophe—Man, Nature, and Climate Change, Elizabeth Kolbert, Bloomsbury.